Professional Dog Grooming - Mayrich Kennels Inc. Dirty Dog? We Can Help! Mayrich Kennels offers full Grooming Services! We welcome all dogs into our salon and specialize in Aggressive, Fearful & "Hard to Groom" dogs. All Dogs Must Be Up To Date On DA2PP & Rabies Vaccines. Vaccine Records Are Required Before We Groom Your Dog. We welcome all special needs dogs including working & sport dogs, aggressive, fearful & "hard-to-groom" dogs! 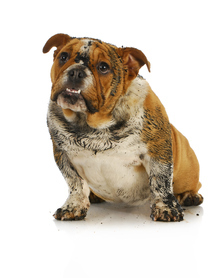 We will work with your dog to improve their behavior at the groomers and to make the entire experience reinforcing. We are not "Speed" & high volume groomers. We take in 1-2 dogs per day max to groom. Our motivation is to minimize the stress normally associated with grooming. We work with your dog, take the time necessary to give them breaks and make them feel comfortable. We want your dog to enjoy their experience and we will always put their best interest first...and on top of that, we do an awesome job making your dog look their best! -Ear Cleaning ** We will not pluck ear hair, this is dangerous and can lead to serious ear problems and infection. We will trim ear hair if necessary after discussing options w/ you.